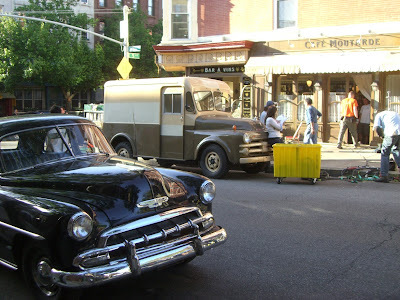 Today they were filming Julie and Julia in Park Slope. The movie is based on this book about a woman who tries to cook all of Julia Child's recipes from Mastering The Art of French Cooking, Volume One in one year in order to change her life. The film is based in the 50's in Paris and Cafe Moutarde was apparently a stand in for a French cafe- hence the classic cars. 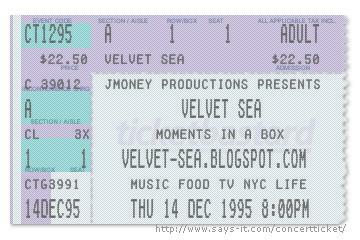 The movie has a bunch of stars in it, most notably Meryl Streep as Julia Childs. I spotted Meryl today walking to her oversized trailer (it looked like she had an entire huge trailer to herself whereas the other "stars" had like 1/5th of a trailer each). She was wearing a plaid suit with her hair tucked under a matching hat and striped very high wedge shoes- at least 3-4 inches. What's the deal with this place? 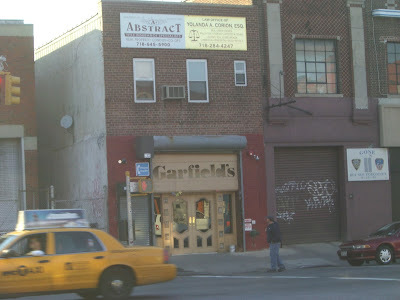 It seems odd that they placed their Garfield's signage under the roll up gate so you can't see it most of the time since they never seem to be open. I peeked in- it goes back really far- all the way to the block behind it. Looks like a bar/restaurant possibly. Or just a bar.